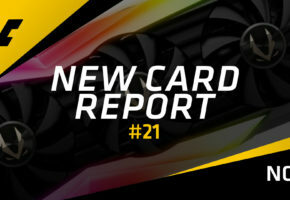 In ‘New Card Report’ we are only looking at the cards that were not mentioned before, at least on our website. The GPU market entered a stagnation, which was shortly interrupted by GTX 1070 Ti launch. Most cards here are special editions or variations of existing models. EMTEK released GTX 1070 Ti Dual (the same design as Palit/PNY/Maxsun) and three FinalFantasy 14 Editions of GTX 1070/1060 graphics cards. The official name of this card is “Net Gaming Watercooled WA1”. This card was designed only for one purpose: watercooling. You are probably wondering, who wants to watercool a GTX 1060 3GB? Well, in China mid-range cards are mostly used in Internet Cafes. This allows Cafe owners to reduce the heat and noise by daisy chaining multiple PCs with the same water cooling loop. Both of these cards have not yet been released by Gigabyte. The Windforce is using a different cooler design than Gaming. It’s also worth adding that since the launch of the new SKU, Gigabyte began advertising OC profiles on their website. This means that ASUS STRIX is no longer the only 1070 Ti card with non-reference clock speeds listed on the official website. Of course, those frequencies require in-house software to manually change the overclocking profile, but at least you know what these cards are capable of. Manli has three new GTX 1070 Ti cards. The first one is not even listed on the website — it was announced by the water-cooling company instead. A trio of GTX 1070 Ti cards from Maxsun. Yes, Big Mac is the actual name, and no they did not ask McDonald’s for permission. Maxsun has no problem using other trademarks such as Terminator or Transformers for other models either. What’s interesting about GTX 1070 M.1 is that the board is actually powered by dual 6-pin power connectors (reference design ships with a single 8-pin connector). Palit released Super JetStream GTX 1070 Ti. At launch, we only saw JetStream and Dual models. Sadly, due to NVIDIA’s frequency restrictions Super JetStream and JetStream ship with the same clock. In fact, Palit does not even explain the differences between the two cards (higher power limit maybe?). ONDA quietly launched three GTX 1030 cards, five GTX 1050 series models and two GTX 1060 3GB. We haven’t really mentioned PGF GTX 1070 Ti edition yet. There are two models released for Chinese market. Since all 1070 Tis ship with the same clock, the only difference between PGF and PGF Supreme is a MicroUSB port.